One of the most defining stories in the ULTIMATE UNIVERSE explodes in a way no one saw coming! Only one of the two ULTIMATE SPIDER-MANS shall rise! 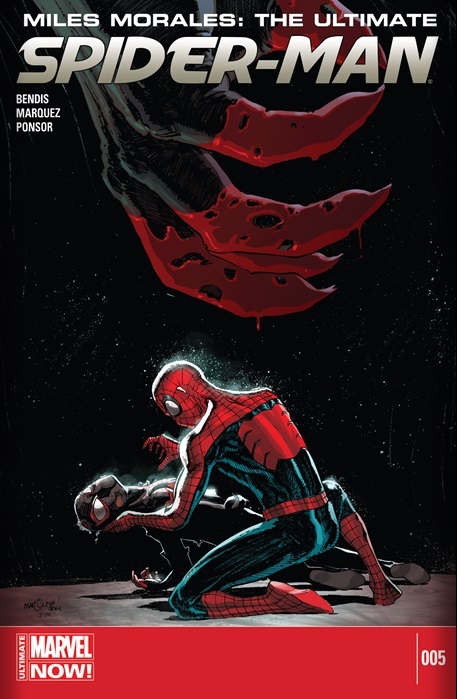 Cover– This month we have Miles beaten and unconscious in Peter Parker’s arms in the background while a bloody clawed hand drips in the foreground. Story– The Spider-men escape from the police but Miles is injured. He is rescued by Maria Hill whom he confides in. Norman Osborne visits Jameson at his apartment and Miles finds Peter Parker at the home of Mary Jane Watson in Queens. Art– As always the art is tight, slick and totally on point! Characterization– Miles world has been turned upside down yet again in typical Bendis fashion. He’s out of his depth, confused and injured. Sounds like a good time to me! The real winner this issue was Norman Osborne his lucid talk with Jameson was touching and scary at the same time since his confessions also underlies his damaged and fractured psyche. Peter Parker- Clone, real or not I’m totally bummed this “perter” is back. Miles has been doing a great job without him. Why is he back in any capacity? Pacing– The pacing of these recent issues may seem a bit rough or rushed to some readers.